“I can’t take any calls right now,” he barked to Marvin, his assistant, while wiping a bit of guacamole ranch from the corner of his mouth. The tail of the chicken lettuce wrap, a trade name for a boring burrito that his firm had actually trademarked a few years back, had disintegrated into a gooey mess inextricable from the rest of the silvery foil crumpled by his keyboard. “My cousin?” he replied, scrunching up his face. “Okay, will you get that door then?” Marvin rolled his chair away from his desk and swung his long arm backward to slam the door shut. “Yeah, hello?” he said after finally punching the blinking light on the office phone. “Stephen, listen to me,” the voice on the other end of the line said earnestly. “It’s time,” she said after a pause. “No it isn’t,” he said, forcing a chuckle. She went silent for a moment. “You’re the first I’ve talked to after my dad called,” she answered weakly. He glanced at the artifacts around his desk–photos, computer screen, calendar. It began rather simply. Darren sat down at his desk on the morning of May 22nd intending to write a piece about the president. He typed out the title first, “The Failed Presidency,” and then found himself writing and deleting several beginnings before giving up and trying at the middle. Often when he was stalled for an opening, going right at the heart of the thing would get him moving, let him find his footing. Several times he tried to work at what, precisely, he was trying to say about this president and the way in which dogged opposition seemed to have stymied every positive gain of the administration. But again and again, he repeated the same steps of typing and then erasing every thought. So he went to lunch. He and his usual crowd sat about, chatting about politics, basketball, the secretary with the nice tooshie (though they did not use that term), and all the usual male banter. Darren didn’t notice–nor did his friends–that he had less to say than usual that afternoon. Returning to the office, he decided to try the next tier of his strategies for fighting a block. He wrote without deleting, without censoring his thinking, and without paying any regard whatsoever to how well his words were shaping into anything substantial. Usually this would allow him to find some footing and once he had traction, he could go back and edit out the extraneous material. For most of the rest of the afternoon, he tried this. As the afternoon wound on, though, he felt that his pace was slowing, that even without deleting or double guessing his choice of words, his output was diminishing. Finally, after finding himself staring at the pulsing cursor for several minutes without result, he decided to go back through what he had written so far. From all of it, he liked only a few phrases, such as “dueling scandals” and “wet dreams of impeachment.” Most, though, seemed mired in cliche, such as “spin control overdrive” and “smelling partisan blood in the water.” What was worse was that in all that he had written–a few thousand words–there was no thread he felt could lead to a better article. He had even caught himself hemming and hawing so much in the course of his argument that he’d contradicted his own thesis. At home that evening, he thought little about the problem. It wasn’t the first unproductive day he’d had on the job, after all. He didn’t even mention it at the dinner table. After two more days, though, he was becoming quite unnerved by his lack of progress. He had tried to launch other articles, but again found he could not even begin. He read and reread the president’s speech on Thursday, searching for inspiration. None was forthcoming. For only the third time in his career, he told his editor he would not be able to make a deadline. Quite despite himself, he only shrugged and said nothing more. And the title was all that he found himself able to compose. Beneath it, the curser blinked inexorably, pulsing in ever slower cycles, until he was sure he was watching it appear, pixel by pixel, out of the aether. His friends called on him for lunch. He mumbled he’d catch up with them, but never did. For the entire day, he watched the empty white page–not a page at all, just an abstract, computer-generated image of a page–and added nothing to it. He knew, somewhere in his bones, how easy it would be to add a word, just one word to that white space. Any word. Just “the.” Simply type “the” to prove you can, he told himself. It was the office manager who found him, some six hours later as the red light on his desk phone blinked insistently to alert him to his wife’s several recorded messages. “Darren?” the office manager said meekly from the doorway. He did not, could not respond. He simply sat in a ball in the corner of the room, his lips and fingers twitching. As I’ve been writing these reviews, I’ve found myself reflecting on the motley crew trope in science fiction a great deal. Alien, The Thing, Prometheus, even the new Star Treks all toy with personality mismatches among their crew to drive tension in their narratives–and all with varying success. Sunshine’s characters are astronauts chosen from the world’s elite to crew a mission to save the sun–more on that mission later–so one would expect something more like the crew of the Enterprise than of the Nostromo. You expect professionals. Boyle’s principal interest, though, is the psychological trials of both extended space travel and, more importantly, bearing the weight of the world on one’s shoulders. Screenwriter Alex Garland said that he wanted the story to come down to a moment when one man held the fate of all humanity in his hands, which is exactly what it comes down to for stellar physicist Robert Capa. Like Alien, the film spends (dare I say “wastes?”) no time feeding the audience canned exposition about the characters and their backstories. We learn about them through their interactions and conflicts with each other. Those conflicts are mild at first–mostly between Chris Evans’s Mace and Cillian Murphy’s Capa–but build as the crew faces greater and greater difficulty. This movie owes so much to Alien that it’s almost impossible to evaluate it independently. Boyle takes a radically different set of space goers and uses the same basic technique to develop them. The instruments of their psychological duress, though, are much more complex than those in Ridley Scott’s film, and that allows them to face more interesting moments together–from choosing who goes on a dangerous space walk to who is left alive when oxygen starts to run out. Real physicists and astronomers have gingerly poked holes in the science of the film. 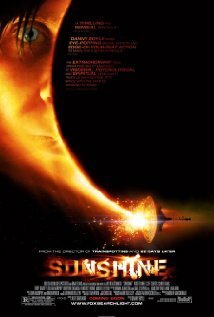 The idea of a dying sun was inspired by real science, but since the universe’s heat death is billions of years away at the earliest, it wasn’t a viable plot for the film. Eventually, Boyle and Garland concocted an explanation for the sun’s demise using real physics (Q-ball, anyone? ), but it wasn’t enough to satiate hard-science purists who noted that the film’s portrayal of gravity and movement in the solar system was inaccurate. Still, the film takes much greater pains than most science fiction to create a believable, grounded story of space travel. This is hell and gone from a space adventure, and Boyle’s detailed (if imperfect) world within the Icarus II is compelling because it is so contained–as any real venture out into space in the foreseeable future would be. For most of the movie, the conflicts come from space itself. Human error leads to calamity and the crew must push themselves to accomplish their all-important mission. Later, though, an actual antagonist emerges. Now, the crew should have known that the original mission’s commander would turn out to be evil. He was played by Mark Strong, after all. If Mark Strong is in your movie, FYI, he’s your bad guy. Thematically, this twist allows Boyle to face the last obstacles facing the scientific worldview in his plot by injecting Strong’s character, Pinbacker, as a fanatic, warped by the hardship of space travel and the burden of saving the human race. In the original cut, Capa’s last words to Pinbacker’s religious ranting were to have been, “I don’t believe in God.” There’s a certain arrogance in the astronaut’s mission–to change the course of human destiny–and for much of the film, we are meant to wonder if we are truly up to the task, if we should be trying. Pinbacker’s emergence frames that arrogance explicitly in the last act, but ultimately, his literally faceless villain is less compelling than the earlier challenges the crew faces. Just yesterday, I mentioned Ridley Scott’s visual aesthetic in Prometheus. Now, Scott is one of my favorite directors by far, but Boyle’s visual style is more distinctive still, and Sunshine’s visuals are every bit as striking and powerful. As with the plotting, this only breaks down when Pinbacker arrives. Boyle hides his burned antagonist in jerky shots and pours in acoustic noise. It’s a little too film-school and it subtracts from what is otherwise a sensory feast. The opening voiceover, like most voiceovers, seems wholly unnecessary. It was clearly not part of the original screenplay since Evans’s Mace later provides all the same information to orient the audience. The computer for the Icarus is pretty smart. I can certainly see artificial intelligence advancing that far within the timeframe projected in the film. What I’m wondering about, though, is why the computer didn’t mention when it detected a new, unknown crew member boarding the ship. That would’ve been a helpful head’s up, Icarus. At one point, the film would have featured a romantic subplot between Murphy’s Capa and Rose Byrne’s Cassie, but Boyle wisely thought better of it. He even decided to deprive Ms. Byrne of make-up to deflate any such expectations in the audience (which is a total fail–come on, it’s Rose Byrne). Expectations were high last summer when Ridley Scott’s return to the universe he helped create in Alien came to the big screen. Sadly, what we got was a deeply flawed film that suffers from one of the greatest blights in modern Hollywood: Too-Many Cooks Syndrome. 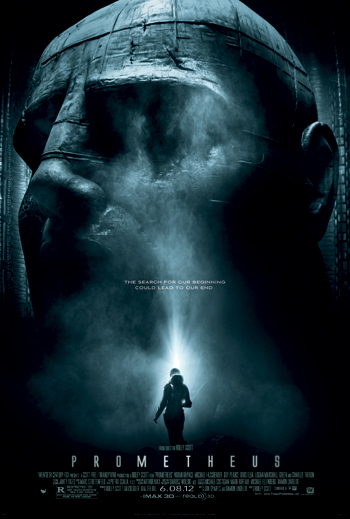 Prometheus was passed between screenwriters while Scott also tinkered with his concept for the film. It shows. Even my kids, who usually tell me I’m being way too critical when I nitpick movies, had a field day pointing out the problems with this stinker. First of all, the good. Prometheus is a beautiful piece of cinema. Visually, it is rendered gorgeously from beginning to end. This ship (though clearly derivative of Serenity) is luxuriant. It’s a marked contrast from the dark caverns of the Nostromo in Alien. The Prometheus itself is closer to the starship Enterprise in its pristine corridors and high-tech displays with floating holographics and lush colors. The sweeping vistas of the opening are absolutely breathtaking. As Scott revisits the imagery from his original film, he injects fascinating new life into what we saw as relics and fossils before. And, that’s pretty much the last of the good things I have to say about Prometheus. In my review of Alien, I commented on how poorly Prometheus’s characters compare to those in the original. We are positively surrounded in this film by characters we don’t care about and barely understand. You’d think a mission like this would call for professionals, but we get xenobiologists who run from dead bodies, but cuddle up with clearly hostile looking eels. We get a corporate snake-woman (with daddy issues) who doesn’t believe in the mission she’s given up years of her life to join, instead of running papa’s company back home her way. We have a ribald space captain who wants to bang the boss because…well, because she’s Charlize Theron. If the leads redeemed this motley crew, maybe it would be tolerable, but alas, it was not meant to be. Charlie Halloway becomes petulant and despondent when he learns that there aren’t any live aliens to explain all the mysteries of life to him. This is shallow character development to say the least. Hell, it’s callow character development. This man is an archeologist who has spent years digging in the dirt for the clues that led him to this distant planet. One would not expect him to be such an impatient little baby-man. Also, he’s a total jerk to David for no reason. Likewise, the development of Shaw is equally shallow and predictable. She’s conflicted about faith because of her own daddy issues. She also feels inadequate because she can’t have children. Come on, Ridley, your exposition is showing left and right here. It’s a trend in Scott’s later work. Whenever I see empty characterization like this, I think of Brendan Gleeson dancing around and sneering in Kingdom of Heaven (a film that I think succeeds despite such clumsy moments). Noomi Rapace and Michael Fassbender do admirable jobs with the material they’re given, but it’s just not enough. Because this movie doesn’t know what it wants us to do: think or be afraid. Scott continually throws in his hamfisted “big” questions, but then the scene quickly changes to some monster/action scene. We are treated to an alienish snake attack, a zombie bloodbath, a squid abortion, and a giant white dude rampage–none of which seem to fit together into any coherent whole. It’s a jumbled mess of threats because deep down, Scott wants us looking elsewhere for an antagonist. Is it David, who is coldly following his orders and condescending toward the flawed human beings around him? Is it Vickers and her calculating single-mindedness? Or late-comer Weyland whose greed for life is supposedly driving the entire enterprise from the belly of the ship all along? In the end, none of them is particularly compelling, leaving us feeling like protagonist Elizabeth Shaw’s real enemy is bad screenwriting. The black goo seems as wildly improbable as it is inconsistent. Even assuming that the stuff we see the first “Engineer” drink to seed life on (presumed) Earth is a different formula, the effects vary widely from scene to scene. It turns the little worms in the giant head room into snakes, which then try to jam themselves down the biologist’s throat. Based on what happens to the last Engineer, you’d think that’s a prelude to a chestburster, but none is forthcoming. Charlie’s infection is primary and leads to him siring a monster, but then a primary infection in the geologist makes him into a really, really unfriendly zombie-type thing. Basically, the only consistent principle of the black goo seems to be: make everything worse! The Engineers have some interesting design aesthetics and a really crappy understanding of ergonomics. Their biological storage labs are laid out like temples with murals and giant head sculptures. Meanwhile, their control panels require the user to lean way forward out of his ginormous chair to touch the goey, egg-shaped buttons–oh, and the on switch is a flute, go figure. So, um, where did the aliens who burst out of all those Engineers’ chests go anyway? Like I said, everything in this movie looks sumptuous and convincing…except for the god-awful old-age make-up on Guy Pierce. Whoever at Weyland Robotics wrote David’s passive aggressive dialogue sub-routines needs to be fired. The really sad thing is that there was a better movie than this on the cutting room floor. The deleted scenes really fill in some of the gaps that left audiences scratching their heads. The biologist, whose conflicted reaction to alien life was so conspicuous in the release version, would have earlier shown his excitement over finding living worms on the planet (hence making his appreciation of the snakey thing later somewhat more believable). In an alternate version, the zombie version of Fifield that attacked the ship was much more like the traditional alien xenomorph in both appearance and movement, evoking more menace and connecting Prometheus to its cinematic lineage. The last Engineer’s nature is seen more fully in cut scenes. He talks to David at greater length, with subtitles that seem to give credence to his outrage. He is also humanized further as he enters the remains of the Prometheus, before finding Shaw, making him less monster and more the “maker” he was meant to be. These changes wouldn’t have completely transformed the film (ala I Am Legend‘s original ending) but they would have strengthened it. It’s absolutely puzzling why Scott left us with this cut of the film. And just what is with that final crash sequence? First of all, thanks for ruining the climax of the film in the trailer, Hollywood. More importantly, though, the Prometheus is not a really big ship. We see the bridge’s relative size to the exterior in the opening sweep over it. Likewise, we know the alien doughnut ships have HUGE internal volumes from the scene in Alien when Cain descends into the egg chamber. So really, the Engineer’s ship should dwarf the Prometheus, but instead, it looks like a fair fight when the human craft crashes into it. But what happens next is the real problem, though I guess it shouldn’t surprise us that filmmakers so comfortable throwing out every rule of biology would also pay no attention to gravity. The damaged Engineer ship free falls slowly enough for Shaw and Vickers to make what would, in the real world, be a futile effort to run away. The shockwave from the crash would have killed them no matter how much sprinting they did, but the ultimate insult to the audience’s intelligence, though, comes when Shaw is saved by…a rock. I have a penchant for certain words. I have 82 poems titled “regret.” And 17 called simply “cobblestone.” I think I’d like to imagine these are trademarks, and not collectively a rut. Still, it worries me. “Worries?” No, that’s no good. Vexes. It vexes me…in the wee hours…no, um…it vexes me in the cold, solitary hours when the world does not exist but for me and my pen. Yes, that’s it. I wonder how much I really have to offer. In all my stories, I see the same resolution unfolding. Even when I sit down, determined to write a different arc for some new character, I find invariably that the characters demand their logical conclusion and that conclusion is always the same. In all of my stories, the protagonist has to kill himself to get the girl. Even Raymundo Caligular, the gay sea captain, ended up cutting his own throat to impress Bernadette Von Trudeau, the mermaid queen. You’d think at least he wouldn’t want to make a grand gesture for a woman, but nope, in the end, it was the only end he could want. The plot demanded it, as it always does in my stories. For me, the hero always has to die with so much left to do, with some colossal store of kinetic energy. Whole volumes that will go unwritten. And of course I know what it all means. I know what it says about me, and I’m not sure whether to be proud of myself or not. After all, this pattern reveals that lowly I, humble me, have escaped the one great fear of every human breast. Oh, dear, I’m really overdoing it. It must’ve been mentioning Raymundo that got me going like that. He always was too longwinded. What it means is that I’m not afraid of death, right? That’s good. But it also means that I’m living in fear of the other ending. I’m terrified of that place at the end, the place without any words left.